It sounds a little silly to call the second game of the season a must win. 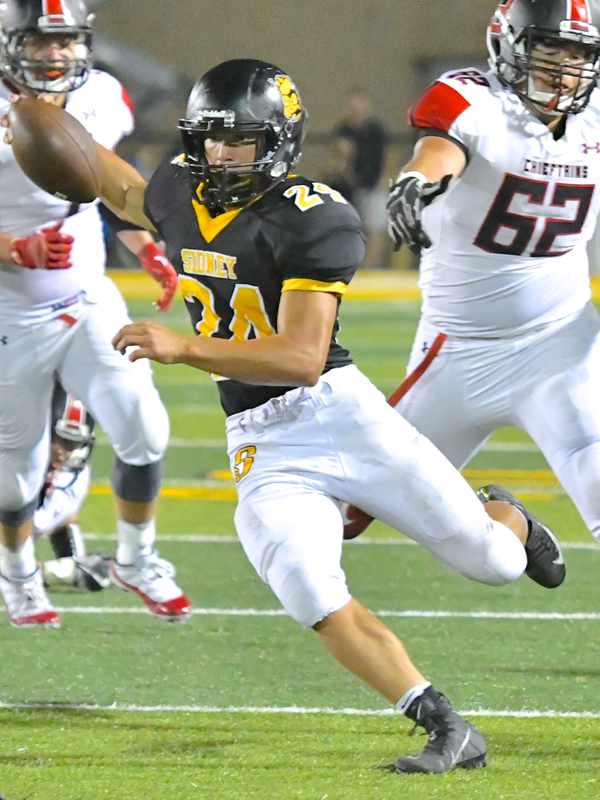 For the Sidney Yellow Jackets and Bellefontaine Chieftains, however, two playoff teams from a year ago that struggled mightily in week one, Thursday night’s showdown was exactly that. 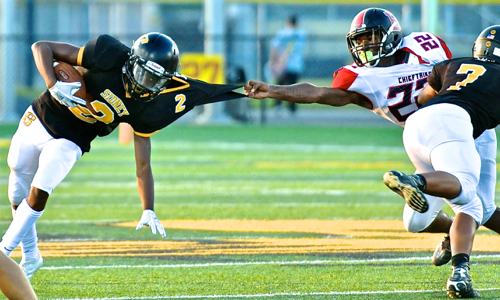 Sidney – You see it often at every level of football. A game dominated for more than three quarters by the offenses is ultimately won down the stretch by…the defense. 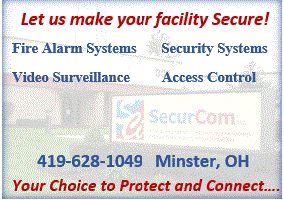 So it was Thursday night at Sidney Memorial Stadium. Trailing by a field goal with 5:41 to play, the Bellefontaine Chieftains took over at their own 32 yard line and began rolling, as they had much of the night, toward the Sidney end zone. Sparked by the two-headed monster of running back Garrett Gross and quarterback Grant Smith, the Chieftains met little resistance in moving to the Sidney 26 yard line. Coach Adam Doenges has a pep-talk with Hallie Truesdale. But a funny thing happened on the Chieftains way to the game winning score. After a procedure penalty on first down, the Jackets held the Chieftains to 2 yards on three running plays. 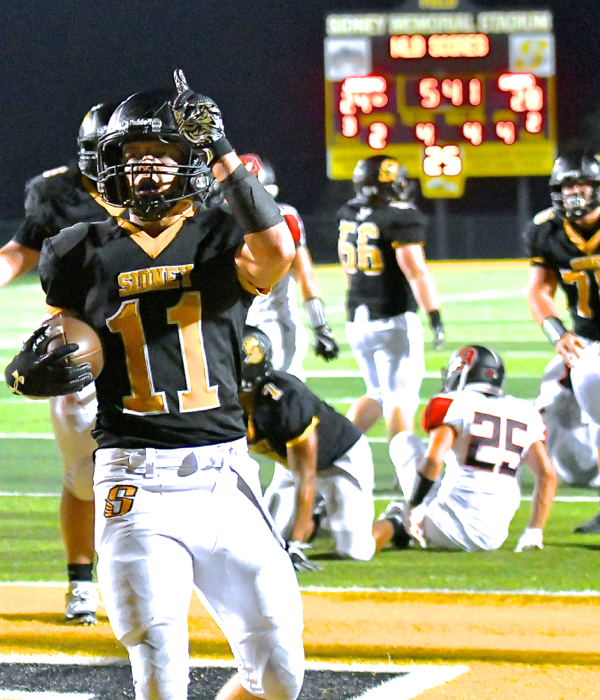 On 4th and 13, Smith’s desperation pass, his only attempt of the second half, was picked off by the Jackets’ Darren Taborn to preserve an exciting 31-28 Sidney victory. The win, in a series dating back to 1899, gave the Yellow Jackets a 60-42-9 lead in the series all time, and was a marked improvement over a 35-7 loss to St Marys in week one. The Chieftains took the opening kickoff and wasted little time setting the tone for the evening. With Gross, a 5-10, 195 pound junior, and Smith, a 6-2, 200 pound junior doing all the work, the Chieftains went 65 yards in ten plays for the first score of the night. Smith scored from the 4 and Bellefontaine led 7-0 after less than 5 minutes. Latham Jones hauled in a 25 yard pass from quarterback Ryan Dunham. The Jackets came right back, driving 80 yards for the tying score. Junior quarterback Ryan Dunham, who was intercepted three times last week at St Marys, found fellow junior Lathan Jones in the right corner of the end zone from 25 yards out to tie the score. “The game slowed down for me a lot tonight,” Dunham said afterward. “I had more time and was able to see downfield and gt the ball to my teammates. “The Spot” Restaurant, in Sidney, is proud to be the official sponsor of the 2018 OHSAA State Basketball Tournaments on PressProsMagazine.com. Three plays after the tying touchdown, senior defensive back Josiah Hudgins stepped in front of a Bellefontaine receiver and picked off a Smith pass. The ensuing 42 yard return gave the Jackets their first lead of the season 14-7. 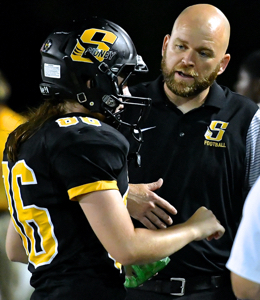 Smith scored again, this time from the one, to cap a 12 play, 69 yard drive to tie the score early in the second, and the Jackets got a 20 yard field goal from Hallie Truesdale after a 71 yard drive stalled at the three. The Jackets took that 17-14 led to the locker room. Jackets got a 20 yard field goal from Hallie Truesdale after a 71 yard drive stalled at the three. Neither team could stop the other early in the second half. Sidney went up 10 on a 23 yard run by E.J.Davis, a 5-10 freshman splitting the quarterback duties with Dunham. Bellefontaine came right back on a Smith three yard run, and Sidney led 24-21 going to the fourth. It appeared that Sidney had come up with a stop early in the fourth quarter, but Bellefontaine coach Toby Smith rolled the dice on 4th and 4 from the Chieftain 44. The gamble came up golden when Gross broke thru the line of scrimmage and out-raced the Sidney defense for a 56 yard score, and a 28-24 lead with 10:32 to play. Sidney, which had stalled at the Bellefontaine 13 on its previous series, would not be denied this time. Dunham picked up a key first down with an 11 yard run, and Caleb Harris found the end zone from 4 yards out with what turned out to be the winning score. The Sidney defense did the rest. “We buckled down when we needed to,” Doenges said. “We have to keep working. We don’t have a lot of linemen, and we just need to keep getting them reps. We will keep getting better. That’s part of our game that we have to keep working on. After mustering just 192 yards total offense, and turning the ball over 5 times last week, the Jackets looked like a totally different team. 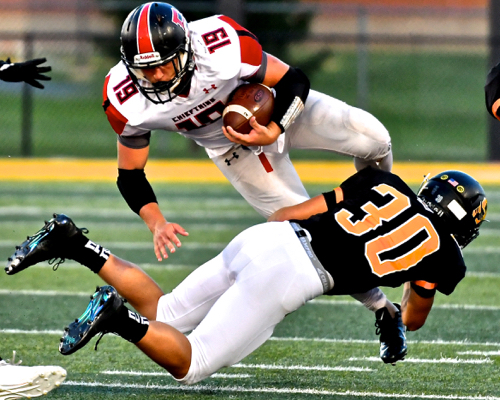 Led by Caleb Harris’ 111 yards on 18 carries, and Davis’ 98 yards on 9 carries, Sidney ran for 254 yards on the night. Dunham and Davis combined to go 11 for 16 through the air for 191 yards. That’s 445 yards total offense…and NO turnovers. 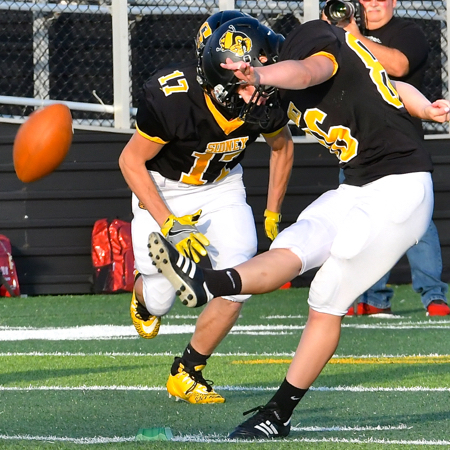 Yellow Jacket Cam Vordemark trips-ups Chieftain’s Garrett Gross in Sidney’s Thursday night win. Doenges had high praise for Davis, who didn’t play last week against St Marys. For the Chieftains, Gross finished with 210 yards on 27 carries, while Smith gained 131 on 23 tries. The Chieftains passing game was non-existent…2 for 5 for 1 yard with 2 interceptions, one for a touchdown and the other the game clinch in the final minutes. Yellow Jacket Noah Smith stretches wide-right for his yardage. “We came into tonight not wanting to feel the way we did last week,” Dunham said. “I had no doubt on that final drive that we were going to score. I have a lot of trust in my coaches and teammates nd I knew we would get the job done. For the Jackets, it was their second straight shootout win in the series (Sidney won last year 42-33), and Doenges was happy to get out of a short week with a win. 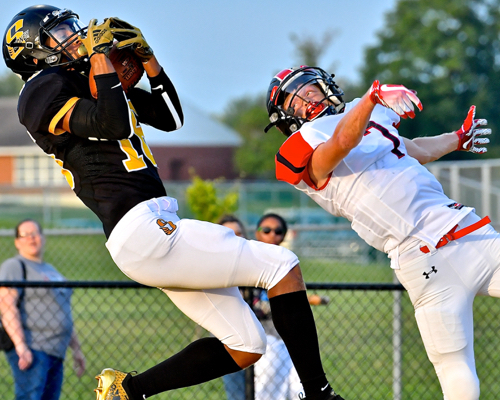 Sidney’s Caleb Harris brings one to the house.